Arsenal are dead. 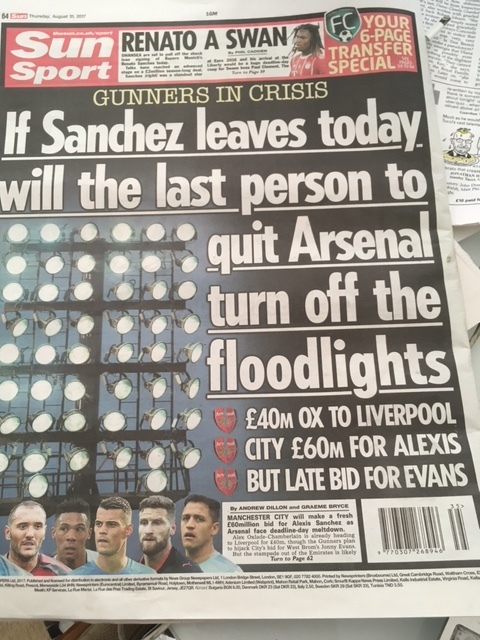 So says the Sun, which links the club’s pulse to Alexis Sanchez’s whims, declaring that when the Chilean quits the club today – it is “inevitable he will, says the paper’s Neil Ashton – he’ll be leaving behind a corpse where there was once a club. Sanchez would also be leaving the leeches, footballers whose presence at Arsenal is more parasitic than proud. Granti Xhaka, Shkodran Mustafi, Lucas Perez and Calum Chambers are rubbish on the “Arsenal scrapheap”. Arsenal Football Club, Rest In Peace. This institution, one of the most famous clubs in the world, is dead and buried. Here at the Emirates, the heart finally stopped beating. Arsenal, no matter how many times they win the FA Cup, are only ever one defeat away from another meltdown among their fans..
To wit the obvious question: is Neil Ashton a Gooner?